Our properties are available for vacation rental (2 nights minimum to longer term on a monthly basis). 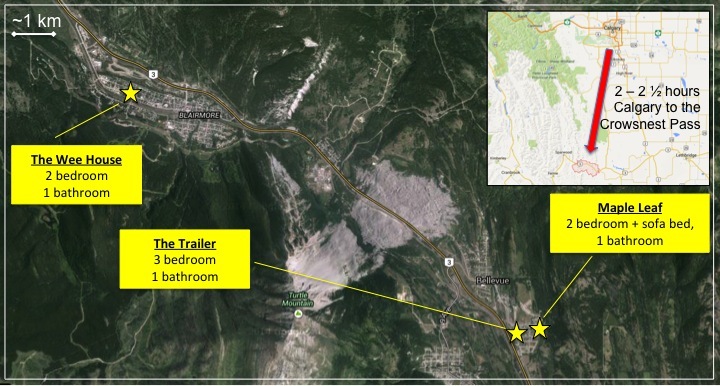 They are fully furnished and offer comfortable accommodations to those wanting to enjoy the Crowsnest Pass. All of our properties are reasonably priced from $120 – $150/nt for 2 people, $20/nt each additional person. We offer 7 nights for the price of 6, and additional discounts for monthly rental. Long weekends, special events and the holiday period are at a variable premium. Please contact us on 403~464~3224 or 403~796~4950 for rental enquiries or email. The Wee House (Blairmore, Alberta): A cosy two bedroom, one bathroom home on the Main Street of Blairmore offering walking convenience to the river, pool, tennis courts, shops, restaurants and bars. Fully furnished, newly renovated with open living space, new appliances including washer / dryer. 1 x queen and 2 x twin beds. Has fire pit and BBQ. Maximum 4 persons. $150 / night for two + $20 / additional person. The Trailer (Bellevue, Alberta): Enjoy a rustic three bedroom mobile home in lower Bellevue (Maple Leaf). Great for three couples, some friends or a family – but you must be friendly as there is only one bathroom. Newly renovated kitchen within the open living space. Appliances include washer / dryer. 1 x queen (master), 1 x queen (small room), 1 x double (small room). Has fire pit and picnic table. Maximum 6 people. $120 / night for two + $20 / additional person. Maple Leaf (Bellevue, Alberta): A two bedroom, one bathroom home in the quiet section of Maple Leaf, one block from Cougar Ridge. Views of Turtle Mountain from the kitchen. Very quiet in the evenings with a fire pit and BBQ to enjoy in the yard. 1 x queen (large room), 1 x queen (small room), 1 x sofa bed (living room). Maximum 6 people but 4 recommended. $130 / night for two + $20 / additional person.